Retirement Gender Gap | First Financial Security, Inc.
Women from all generations have reason to be concerned about whether or not they’ll be ready for retirement due to the retirement gender gap. The annual Gender Gap in Financial Wellness report found encouraging signs of slight narrowing of the divide between men and women in 2015.1 Despite this good news, women still have a long way to go to ensure they’ll be financially secure and overcome the retirement gender gap. 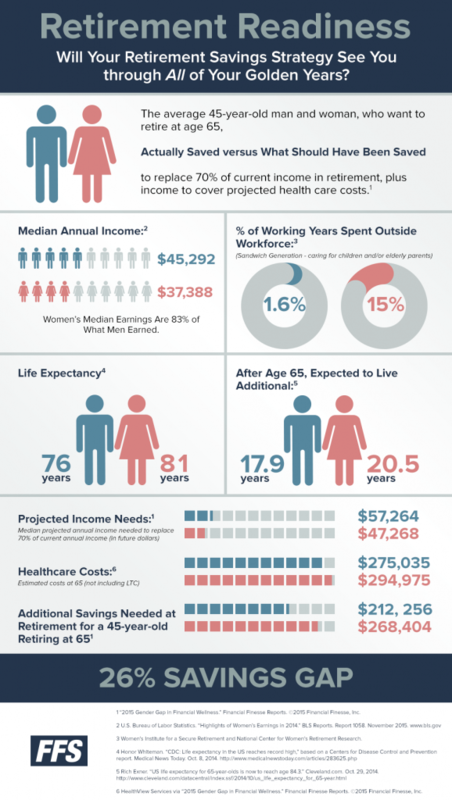 The report compared what 45 year olds actually saved for retirement versus what would be needed to replace 70% of current income and cover projected health care costs in retirement. Moves in and out of the workforce more than men traditionally do. Lives longer than a man, and faces the rising health care costs that come with longevity. Earning less money over time reduces the amount of income from sources women count on in retirement – Social Security benefits, contributions to pensions and retirement accounts, savings to pay off a mortgage or buy a new home, and others. Without these income streams, a woman will find it difficult to match her current standard of living in retirement. Women are usually the ones who leave the workforce to take care children and aging parents. It is time off without pay and without the ability to make contributions to a 401(k) plan, as well as receive any matching company funds. While Americans are living much longer than previous generations, many people haven’t adjusted their retirement strategy to overcome the retirement gender gap and to reflect the possibility they may live up to 20 years beyond age 65. Even though women have a slightly longer life expectancy, both genders would need significant additional savings to cover the anticipated cost of health care. For example, a 45-year-old woman, who wants to retire at 65, would need $268,404 more beyond what she has already saved. It’s not much better for men. They would need $212, 256 more. So, what do we do to make sure we’re ready for retirement and that women can overcome this gender gap? Start saving for retirement as early as possible. And, if you don’t have a retirement strategy in place, meet with your financial representative and get one. 1 “2015 Gender Gap in Financial Wellness.” Financial Finesse Reports. © Financial Finesse, Inc.